Base class of all worker implementations. Cancel the currently scheduled parallel process and possibly reduce the number of in-flight work units Returns false if the process does not exist (anymore). Reimplemented in mitsuba::LocalWorker, and mitsuba::RemoteWorker. Return the number of cores exposed by this worker. Is this a remote worker? Release a processed work unit. Initialize the m_schedItem data structure when only the process ID is known. 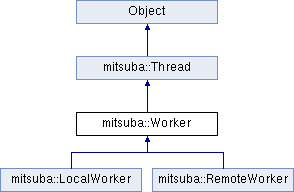 Implemented in mitsuba::LocalWorker, and mitsuba::RemoteWorker.